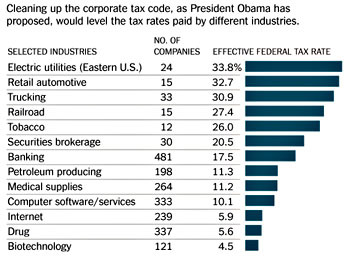 I’ve always been cautious about taking any lessons from the passage of corporate tax reform in 1986. It was, in some ways, sui generis, a sort of miraculous bipartisan stand against corporate interests that’s just very, very rare. And yet: it happened. Twenty-five years ago conservative Republicans were willing to team up with Democrats to do something that was good for the country, and neither side backed down because of either corporate pressure or an unwillingness to allow the other side a victory. It was, in a way, an existence proof that this kind of thing was once possible. In theory, there’s no reason it couldn’t happen again. Democrats are probably willing to go along, and base broadening is, officially anyway, something that conservatives favor. But in real life, Republicans are less willing to work across the aisle these days and Democrats are far more responsive to corporate pressure than they were in the 80s — which is, I suppose, just a longwinded way of saying that American politics is broken and big business reigns supreme. But it’s a very concrete way of saying it, and it lends itself to an almost quantitative assessment. The fate of corporate tax reform is sort of a bellwether for the state of our political system, and I suspect our system is so broken that it will die without even getting a serious hearing.